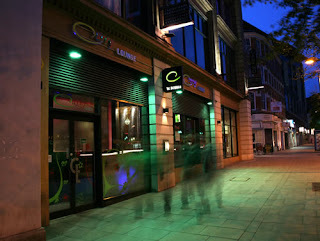 Chef Gordon Ramsay visit's The Curry Lounge, Nottingham, UK, an Indian restaurant owned by Raz, with an over complicated menu and a team of experienced chefs who are struggling to cook it. The restaurant is new and is losing £3000 a week. Gordon notices on the window that he claims to have won awards but in small print it says runners up. Gordon orders sea bass and a DIY Curry, a chicken and prawn hot korma. Gordon is shocked by his naan bread that arrives on a naan stand. The sea bass is tasteless with no seasoning, the DIY curry is greasy with layer of oil and the chicken is dry. Gordon arrives to the service and the customers order anything they like, Raz is trying to please customers but the kitchen struggles and the food takes a long time. The customers say that the food is average and they probably wouldn't come back. The next thing to tackle is to remove the misleading marketing on the windows and Gordon starts scraping the letters off and reluctantly Raz helps. Gordon discovers that all curries options come from 3 stocks, there are jars and tins, frozen samosas and the only freshly made items are the naan breads. Gordon asks Khan to cook every dish on the menu and asks the wait staff to taste the food whilst blindfolded. The staff are unable to identify what any of the dishes are, except the chips! The next day, they visit a local Indian market and Gordon decides to ask Khan to add a regional special to the menu, he decides to make a lamb korma dish. Gordon decides for the evening service to rip up the DIY curry menu and to tell the front of house staff about the special dish for the evening. Khan cooks Gordon his special and Gordon says it is delicious! After an hour of service, no one has ordered the special and customers tell him they hadn't been told about it. Gordon pulls Raz aside but he still refuses to introduce the special, forcing Chef Khan to do so himself and the customers love it. Gordon realises that it is the front of house vs the kitchen so he takes them for a team building cricket game but the next day Gordon discovers the front of house meeting without the kitchen. Gordon's next idea is a tiffin lunch service, the tiffins will contain chicken curry, rice and vegetables and this will help fill the restaurant by giving the locals a sample of the food on offer. The 40 lunches sell out within 5 minutes and they return to make more, the staff are impressed and they hand out leaflets advertising the relaunch. Gordon calls in Alfred Prasad, an Indian chef with a Michelin star to help with the relaunch. For relaunch night, they are offering a new streamlined menu featuring regional items at reasonable prices. Gordon also tells them that they are to be losing the naan bread stands and will be serving them in a basket, the team taste the menu and love the new items. Khan is unhappy about the menu, saying that there are missing regions on the menu and Gordon thinks that he is just jealous that Albert is younger. Gordon takes to the streets with Bollywood dancers and samples to advertise the relaunch. On relaunch night, the staff are working together and the food looks delicious, the customers try to change the menu items but Raz refuses to defer from the menu. Gordon has invited a local curry expert in to sample the new menu. The customers love the new food and say it is much less greasy but the kitchen starts to crumble and customers are left waiting. The critic loves the majority of the food but has some issue with a dry chicken dish. Overall, the relaunch is a successful evening and they have made over £3000. A month later, Gordon revisit's, they are making a profit and the restaurant is so busy that he can't even get a table and has to have a tiffin! Gordon notices that the naan stands are back and takes them to a local scrap metal man! The Restaurant received a special commendation during the British Curry Awards 2009 and a few other awards and is now a franchise and continuing to expand. Trip Advisor reviews are mostly good after Gordon's visit. Raz sold the restaurant in 2015 and in 2017 admitted to tax fraud by failing to pay £45k VAT and falsely claiming £20k of tax repayments from the restaurant, he avoided a prison sentence, has paid back £45k and will repay back the remaining amount by instalment. The restaurant closed in 2018 after failing to secure a new owner. The Curry Lounge aired on December 11 2007, the episode was filmed in September 2007 and is Ramsay's Kitchen Nightmares UK season 5 episode 7. I think this is more about the attitude. This restaurants wasn't terrible just mediocre and unprofitable. Most of the restaurants in the show are just awful. Saying that they can pull off 3-6 months more but still think their idea is perfect and are unwilling to compromise with Gordons suggestions or not diligent enough to keep them up. Here we have an actual business person who understands profits and goes with it and stays with it. I felt Mr. Khan the chef wasn't given much opportunity to contribute towards the new menu (apart from his lamb korma). The poor guy was undermined when the young Michelin chef was brought in. Agree, even Gordon Ramsay who has 3 Michelin Star called experts for indian cuisine for help in KN. When I go out to eat, which I do quite often, I purposely avoid any restaurant that promotes any industry awards such as Best Restaurant, Michelin star chef, etc. There is one simple reason for this. When you patronize an establishment like that, you can expect pretentious food that is overpriced. That type of dining is nothing more than a status statement. I absolutely agree. A Michelin Star is just a reason for the restaurant to raise their prices. I've seen it at a restaurant I went to. They got a Michelin Star and started to advertise on that fact and suddenly they charged 15-20% more for the same food.